Chenderit Sixth Form – What are you waiting for? What do we offer at Sixth Form? At Chenderit School Sixth Form, we are committed to a comprehensive ethos and offer an inclusive, vibrant, dynamic community that values learning and development of the whole individual. 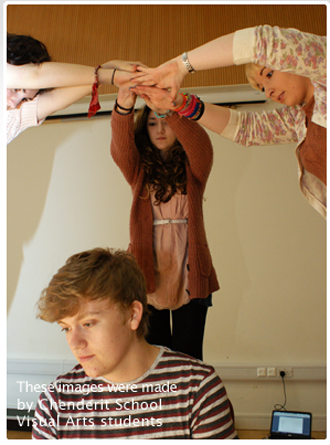 We believe that your time at our Sixth Form will be the most exciting, demanding and rewarding of your life. We expect our students to take either three full A Levels or Level 3 courses, including Cambridge Technicals, over the two years in Sixth Form. We do offer a Level 2 BTEC Customer Services to be taken alongside A Level courses. We also offer GCSE retakes in Maths and English if you don’t achieve a Grade 4. To access these course, we require five GCSEs graded 9-4. Specific subjects have certain GCSE grade prerequisites, which are outlined in our prospectus. At Chenderit, pastoral support is at the heart of everything we do. Each student is assigned to a tutor group and specialist 16-19 form tutor who will help you develop the reflective skills you need to monitor your progress. The Sixth Form team offer the expertise and guidance to support your decisions about academic and career goals. We recognise that for some students accessing A Level study can be challenging and we are fortunate to have a specialised Sixth Form Support Officer in the team. Alongside the directed study periods in Year 12, our students are provided with a programme of core study, which explores many topics connected to living in modern Britain. Additionally, we provide you with opportunities to develop your work experience with a dedicated week at the end of the summer term and a community project which runs throughout the year. Our students are also offered a rolling programme of guest speakers to provide information and inspiration about different careers, universities and gap years. "Being an external student I really feel that Chenderit was a welcoming and friendly environment to be in." Year 13 student. We are able to offer an experienced Sixth Form team. The Head of Sixth Form and Deputy Head of Sixth Form relish the opportunity to work with you through Years 12 and 13 and even beyond, once you have left the school. Ms Norris is our superb Sixth Form Support Officer who works in the Study Centre full time and offers invaluable support and guidance to all Sixth Form students. Alongside our experienced tutors and the Pastoral Managers in the sixth form we can offer comprehensive and wide ranging support to ensure that you feel safe and welcome in school. Through our core and tutorial programme, you will be given information and advice about a wide range of topics, which are relevant to a young adult’s life. Areas such as safe behaviours, democracy, road safety and mental health awareness make up our programmes of study. From the end of Year 12 a lot more focus is given to future ambitions and we offer presentations from universities such as University of Southampton, University of Oxford and Coventry University aimed at those interested in studying for a degree. A number of other specialist talks are offered from local employers and apprenticeship companies such as Aim Apprenticeships. Our students are fantastic ambassadors for the school and take an active part in their learning and the school’s community. Our learning environment is welcoming and inclusive. Through their time with us, students leave ready for the next exciting stages of their lives and we are privileged to be part of this journey. We are sure that when you come to visit the Sixth Form, you will leave with the view that you can make a real difference to your life if you study with us. We are really happy to arrange a personal viewing of the school if you would like any more information about our Sixth Form. Please contact Mr Belstone, Mrs Rowe or Ms Norris who will be happy to organise this for you.